Every once and a while, something happens outside of the sports world that causes me to want to write. Last night was no exception. For years I have loosely tuned in to the Academy Awards. I have to stay in the know although I cannot remember who won Best Picture last year. I love to watch the red carpet footage. The dresses. The shoes. The purses. The hair. The tuxedos. The bowties. I love it. I saw long dresses. Short dresses. Flowing hair. Cropped do’s. Slits. Splits. Midriffs. Louboutins. And a tuxedo short set. Only Pharrell. This year, I actually watched the whole show sans a few minutes where I had to gather snacks, tend to my kitties and fix my lunch for the next day(today). I was excited about potentially seeing some actors and actresses I truly enjoy watching win the coveted Oscar. Plus I love Ellen Degeneres. Over the years, I have gained a new appreciation and respect for those in the film industry(thanks to my friend making waves in Hollywood…Hey Ceej!) who put in long hours on and off screen to perfect their craft. The Oscars are their night to shine and I feel the least I can do is tune to in, even loosely, to see them honored for their hard work. The selfie that “broke” Twitter. The Dolby Theater in Hollywood last night. From Ellen’s having pizza delivered and taking the ultimate selfie to the stars to Pharrell shimmying with Meryl Streep to Robert Lopez winning an Oscar for the song “Let It Go” from the movie “Frozen” to join the rare EGOT club(Emmy-Grammy-Oscar-Tony) to Matthew McConaughey aka Jake Brigance acknowledging God for his success and throwing in an “Amen” in the process. 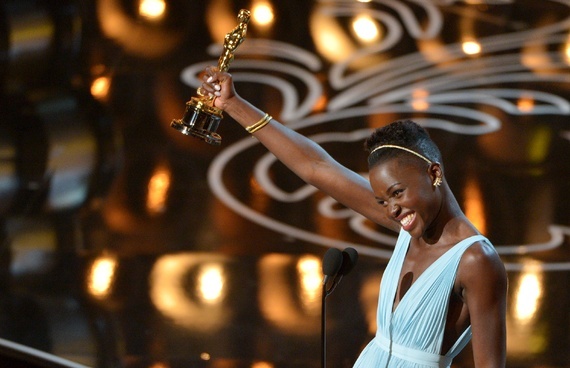 On a night where movie star royalty was front and center, a newcomer who was born in Mexico and is of Kenyan descent stole the show. Her regalness, elegance and sheer beauty are captivating. However, that is not what stands out to me. What stands out is what she represents. In a society where the gold standard of beauty has for many years not resembled Nyong’o, she is just that. A gold standard. She exemplifies everything a woman should be. 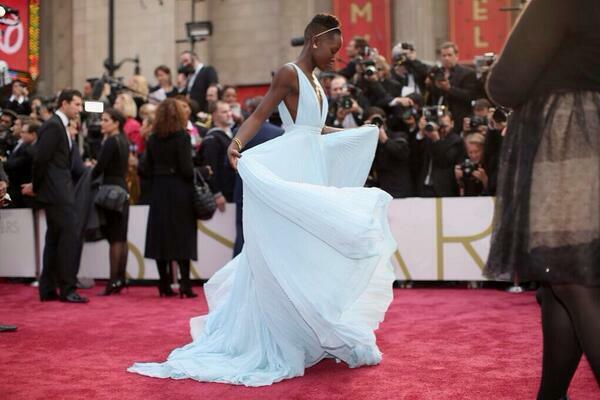 She exemplifies how a woman should carry herself at all times. She exemplifies going against the grain and embracing your God given features. She represents the essence, strength and determination that women all across the world display on a daily basis. She represents you. She represents me. She represents us.